Burial: Mt Tabor Cemetery, Madison County, Indiana. "John Noble was born in Maryland in 1764. He served in the Worchester [militia] of that state as certified by the DAR Index of Patriots. After the end of the war, he moved to Clermont County, Ohio, then to Rush County, Indiana, and finally, during the 1830's to Madison County. "Members of the Noble family settled near the boundary between Boone and Monroe Townships. "They were members of an early Mount Tabor Methodist group that held services in their several homes. Jonathan died the 1844 at the age of 80 years. "He is buried with his wife Jane, in the Mount Tabor Cemetery. It is in Monroe Township [Madison County] along the south side of road 1300 N and just west of state highway 9. 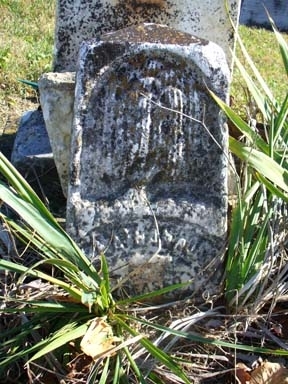 The headstone marking Jonathan's grave is broken but quite legible." According to historian Raymond Davis, one of the thirteen Revolutionary War veterans on record as buried in Madison County is located in this cemetery. Jonathan Noble was born in Maryland in 1764. The DAR Index of Patriots has certified that Jonathan served in the Worchester regiment from his home state. After the Revolution, Mr. Noble moved to Clermont County, Ohio, then to Rush County, Indiana, and during the 1830s to Madison County where he, his wife Jane, and the Noble family settled near the border of Boone and Monroe townships. The family were members of the Mt. Tabor Methodist Church. Jonathan Noble died at age eighty in 1844. He and his wife are both buried here, according to Davis, even though neither is in a tombstone transcription. Perhaps their grave markers were lost before the Madison County Historical Society was able to record their data. There are, indeed, several generations of the Noble family buried here. John N. Noble, 1818-1887, whose stone is pictured at right and who is shown on the 1876 plat map for Boone Township as owning land in nearby section 35, is from the next generation, and perhaps the American Revolution veteran is buried near him.